Culp Valley is one of the best (free) camping locations in Anza-Borrego Desert State Park, situated close to the edge of the mountains on the west side of the park, only nine miles from Borrego Springs and the visitor center, but at a relatively high elevation of 3,300 feet; still hot in summer, but less extreme than the desert lowlands. A very short side road, fine for small to medium RVs as well as cars, leads to several dozen designated sites, in a shallow basin ringed by low peaks topped by rounded granite boulders, similar to many of the popular campgrounds in Joshua Tree National Park. The sites are clean and well separated. The surroundings are particularly good for wildflowers in spring, both on the hillsides and in the upper end of Hellhole Canyon just to the north - this is a long drainage that contains a small spring just half a mile from the campsite, and is one of the attractions of the Culp Valley Trail, a 2 mile loop that also leads to a grand overlook right at the edge of the mountains, 2,500 feet above Borrego Springs and the desert. The spring and the viewpoint can also be seen by separate hikes, each of about 1 mile round trip. The valley is quite a busy location but there are usually camping places available on most nights. More free primitive camping areas can be found close by, along other dirt roads. 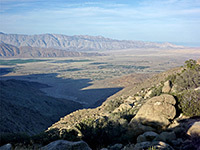 The signposted side track to the Culp Valley campground leaves highway S22 (Montezuma Valley Road) nine miles west of Borrego Springs and 17 miles from Warner Springs, on the outside of a wide bend in the road as it winds through the San Ysidro Mountains. The track soon splits; right leads to the camp area, while left is to the trailhead for the short walk to Pena Spring, which forms part of the Culp Valley Loop, so vehicles may be left at the junction or anywhere along either branch of the road. The left fork is quite sandy and narrow, rising a little to a saddle and dropping down to a small parking area, surrounded by coarse, white sand. A path begins at the far side, signed 0.4 miles to the spring. This soon crosses the California Riding and Hiking Trail, then follows a dry wash down to the spring, situated in the relatively wide, shallow, upper end of the South Fork of Hellhole Canyon. The place is quite overgrown, with lots of tree, bushes and long green grass, and the water is largely hidden. 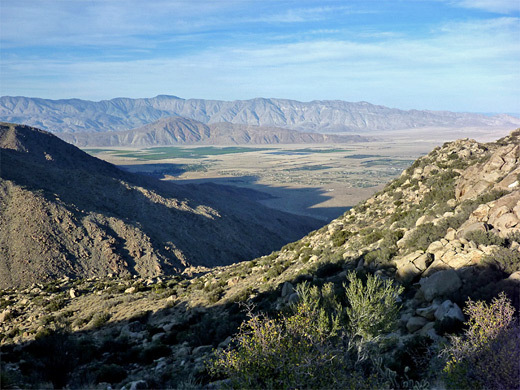 The loop continues by returning along the wash a short distance then turning left (east) on the California Riding and Hiking Trail, up the valley side to a flat area, soon coming close to the edge of the hills, and within sight of Borrego Springs far below. Two connecting trails fork off southwards, to the camp, and the main trail continues a little way to a very short loop, which gives alternative views of the desert to the east.